If you’ve ever wondered what to say when you’re trying to market your services, courses, memberships or digital products you’re not alone. Most service providers can talk about their services for hours on end. They can explain the creation phase, why clients want it, and how to order it. But if you ask them to create copy about their service, they freeze up. They don’t know what to say and worry that their copy will end up sounding lame. So, they become paralyzed by this task. The problem is that not writing good copy is costing you money. Because when you procrastinate on your copy, your sales page doesn’t go up. You don’t talk about your services. Your current clients can’t easily send people your way. The good news is that copy doesn’t have to be hard. In fact, it can be fun to create if you relax and enjoy the process. #1 – Get clear on your who you’re talking to and what your brand’s message is. There’s another language that helps… the language of sales. And without sounding scammy, you can mix these two languages in order to get more leads, clients, and sales. We’ll get to that in a minute but first, let’s talk about your message and how it ties into speaking your audience’s language. Developing your brand’s message requires you to be very clear on your purpose, your priorities and your positioning. List your ideal customer’s pain points. What’s their biggest problem and what solution can you provide to fix that problem? Take a sheet of paper and draw a line down the middle and list each pain point on 1 side and your solution on the other side. List your ideal customer’s current state vs. their after state. So basically what does their life look like now vs. after they experience your product or service. Are they disorganized? Do they overspend their budget every month? Are they overwhelmed with technology and can’t build their website? Do they feel like a failing parent because they work all the time and don’t get to spend time with their child? After using your product or service, do they feel like the world’s greatest dad? Do they have a website that looks great and has great conversion? Do they have money left to invest at the end of every month? List your ideal customer’s haves and have nots. What do they have, what don’t they have before experiencing your product or service and what do they have and don’t have after. For example, before you they may have anxiety, stress, physical pain. They may not have peace of mind, mobility, mental alertness, pride in themselves. After you they should have those things. The key is that you are focusing on the benefits of what you provide and not just the features. You’re answering the question of “what’s in it for me” right out of the gate. When you do this, you’re messaging becomes a magnet to attract the customers you want. Before you write a single word of copy, you need to slow down and consider who you’ll be targeting with your services. Knowing your ideal client is the secret to writing copy that makes clients eager to buy from and promote your brand. If you don’t know who your ideal client is or if you think your buyer is “anyone who wants it” then your copy is going to fail. You’ll be left wondering what went wrong. 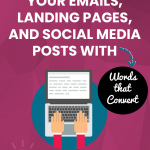 #2 – Get your audience’s attention with words that connect. In order to get and keep your audience’s attention, you need to connect with them by touching their emotions and solving their problems. You would empathize with them. Show them that you understand their frustration. Once they can see that you feel their pain… that you “get” them… then you offer them a solution to their problem. Whatever your product or service, once you’ve captivated them by relating to their needs, show them how you can help them… now. It doesn’t matter what you’re “selling,” the method is still the same. Find out what makes your audience angry. What makes their heart break. What makes them happy. What makes them feel secure or insecure. There are so many human emotions to be touched. In addition to this understanding and touching their emotions, the more problems you can solve for the millions of people out there looking for solutions to the challenges they face, the more you get paid. When faced with a problem, it’s not time to turn tail and run. You should be focused on solving the problems of your audience. You should be finding problems they never even knew they had and offering your services to solve those problems. Now I am not talking about exploitation here. You should not try to coerce people through fear tactics or by being underhanded. You should have an excellent product or service to meet the need that you are putting under the microscope. You must deliver on your promises! Always! Copywriting is about connecting with your audience. When there’s a genuine connection and your audience senses that you truly care, they’re happy to buy from you. In fact, they’ll likely be eager to give you testimonials and referrals! #3 – Get to the point quickly while being clear and concise. There’s nothing I hate more than talking to someone who takes you over the mountains and through the valleys before they get to the point of what they are saying. I don’t believe you have to beat around the bush with people. Get to the point and do it quickly. Your window of opportunity is only so big and if you miss it, you lose your audience. Your message should be methodical. It should have a clear, logical progression that ultimately leads directly to your call to action. With sales letters, brochures, fliers and other marketing communications, your time before your audience is even less than with an actual salesperson. Since you lose that human interaction, being clear and concise in your message is even more critical. #4 – Give them the next step you want them to take. This sounds simple enough but you’d be surprised at how many business owners don’t do it. Never underestimate the power of asking for what you want. Think about your own relationships. We tend to be more relaxed and comfortable with people when we can get a good vibe from them and don’t feel like they have ulterior motives. In advertising, your audience knows that 9 times out of 10 you’re trying to sell them on something. What puts them at ease is how upfront you are and the clarity of your message. Just be clear about what you want from them. Have a solid offer and always, always, always deliver on your promises. There is nothing worse that you could do than burst out of the gate with outlandish promises and have no substance to back them up. Your audience sees right through it. I’ve said it before and I’ll say it again, as long as you know that you are offering a superior product or service, have no fear in giving a call to action. If you don’t let your audience know what you want them to do next, they very likely won’t do anything at all. Think about what you want your audience to do. Do you want them to book a free consult, call your business number, or hit the buy button on your website? If you’re trying to sell your coaching or a 1:1 service, you want your audience to schedule their first session with you. If you want to increase brand awareness on social media then your goal might simply be to get engagement on a post. Once you have the goal in mind getting to the call-to-action is easier and you can weave it into your words seamlessly. Get the Words That Convert HotList which includes the 10 key copy elements you should include in your emails, landing pages and social media posts to make them convert.